My new book focusing on accessibility for Apple users who have low vision is now available for download from the iBookstore. The book includes more than 25 short video tutorials (closed-captoined) to go along with explanations of the built-in accessibility features of iOS devices, the Mac, Apple TV and even Apple Watch (I was only able to record one video on Zoom by visiting my local Apple Store, since I don’t yet have access to an Apple Watch – more videos on Apple Watch will be added in a future update). 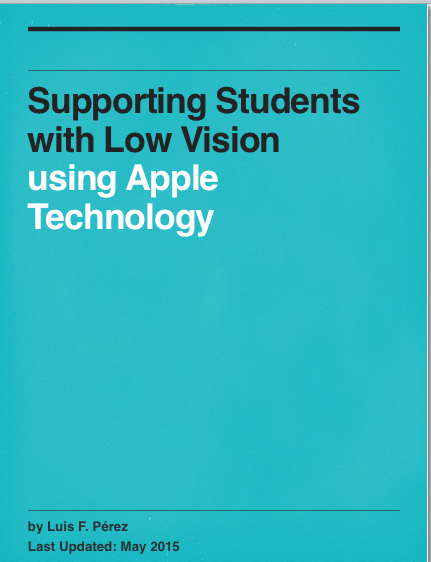 The book also has a section on apps for those with low vision as well as some tips for creating more accessible iBooks content for those who have low vision. A final section focuses on accessories that I use as a person with low vision (stands, bone conduction headphones and the like). I hope you enjoy the book, find it a valuable resource and will provide me with feedback so that I can make future updates even better. To celebrate the release of this new book, I have made a few updates to my previous book (A Touch of Light), which is now FREE.